Many owners who loved their favorite pet and would like to have their dogs was unusual accessories. Of course, today there are many opportunities to simply buy a nice collar at a pet store or order it over the Internet. However, in this case you will have no guarantee that you will not see exactly the same accessory of another animal. You can buy an exclusive thing, but they are usually very expensive. The solution to this situation is simple – you can make a collar for your pet yourself. First, a beautiful collar can be done if you know how to weave bead or macramé. Then you will be enough to buy everything you need to weave beads or a beautiful cords for macrame. If you can not or do not wish to weave a beaded or macrame, there is a possibility to buy a special set for the manufacture of a collars, which you will find all the necessary materials and detailed instructions with a description of how and what to do. A selection of such sets is presented online and in major pet stores. If you wish, you can also buy a plain leather collar at the pet store and decorate it the same beads, rhinestones, studs, buttons, plaques, chains, lace or appliques, which are sold in any sewing Department – will be not worse, but in this case, gift for pet will be made entirely with his own hands, without instructions and recommendations. To complete the track you can add to the collar isa beautiful pendant that can also be purchased at the pet store. Options to make a collar for your pet with your own hands quite a lot. Get creative, and you get exclusive accessory that You just will not find anywhere else. And besides, you'll get great fun creating a collar for his beloved dog on their own. The leash is an accessory needed in every family where there is a dog. When choosing a leash you need to consider not only the breed, size and kind of coat your pet, but also its purpose – will you use it for walking your pet outdoors, in the city or you are training the animal. It should be understood that from the correct choice of leash in some cases may depend not only on how comfortable you will use it, but even the life of your dog. In pet stores today a wide range of dog leash various types: roulette, chain, harness or a regular nylon leashes. However the design leads in the majority of cases do not vary. So if you suddenly want to please yourself and your pet a beautiful accessory, you can try to do it yourself. To begin with, of course, is to buy a ready-made leash, which you will want. Of course, it is possible to make a leash with your hands, for example, to take a few leather cords, weave them, make a loop for the hand with one hand and attach the carabiner on the other. But this accessory might be purchased to give a lead in strength, which is important especially for owners of large breed dogs. So, by purchasing (or having made) leash basis, you can buy everything you need to decorate in any sewing store. 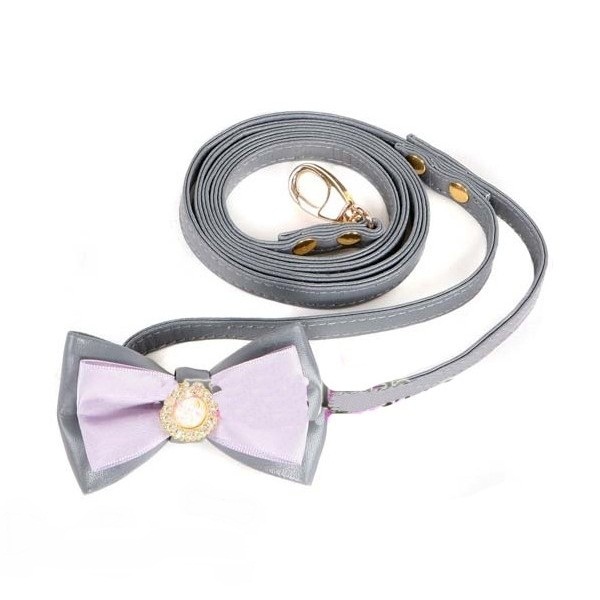 For example, if the basis was taken thin leather or canvas leash can be decorated with various metal studs, badges, chains, buttons, rhinestones, lace, appliqués and so on. There are many options for decorating a leash for a dog, they are limited only by the imagination of the person who undertook the manufacture of this accessory. Importantly, the final result of your work thing was not just beautiful, but also comfortable and functional.